Earnings before interest, tax, depreciation and amortisation (Ebitda) from Iberdrola’s renewable assets increased 38.1% year on year to €1.75 billion for January to September. Meanwhile, net profits from renewable assets grew 57.3% to €598.5 million for the period. The surge in profits came following an increase in renewables capacity and production, its nine-month results revealed. In a statement, the company, attributed its positive results to a "positive performance of renewables in all areas" and increased production in all regions. 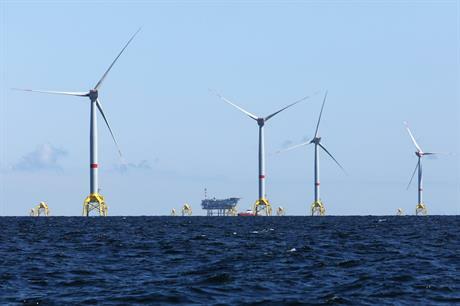 It said its 350MW Wikinger offshore wind project in the German Baltic Sea, which was connected to the grid in late December 2017, contributed to the increase in earnings. Iberdrola added 271MW of onshore wind capacity between January and September, bringing its global total to 15,654MW. It also commissioned an extra 25MW of offshore wind capacity during the period, reaching a total of 544MW. Increases in production outstripped capacity growth, however, as its onshore wind assets generated 27,051GWh in the first nine months of the year, up 9.6% year-on-year. Its offshore wind projects, meanwhile, generated 1,082GWh, up 91.6% on the first nine months of 2017. Iberdrola added that 34% of €3.64 billion invested went to renewables (around €1.23 billion), while 45% was allocated to its networks business. Iberdrola set itself a target of having 3GW of installed offshore wind in Europe and the US by 2023. The company added that the necessary investment to reach this goal was close to €9 billion ($10.3 billion). It currently has just one operational offshore wind farm, according to Windpower Intelligence, the research and data division of Windpower Monthly: the 350MW Wikinger project. However, Iberdrola and its subsidaries, including UK-based Scottish Power, have more than 4.2GW of offshore sites in various stages of development. Renewables profits for its majority-owned US subsidiary Avangrid also grew in the first nine months of the year. Avangrid Renewables recorded $141 million net income for the first nine months of the year, up from $115 million in 2017. It said that increased generation from existing and new wind projects, some outstanding payments and the sale of transmission rights contributed to this growth. However, this was partially offset by transmission-related issued at two new wind farms during the second quarter of 2018 and by expiring production tax credits (PTCs), Avangrid stated. In May, the 800MW Vineyard Wind project Avangrid is co-developing in a 50:50 joint venture with Copenhagen Infrastructure Partners, was awarded capacity in Massachusetts' offshore wind request for proposals.